1 of 2 Cut the top off of the head of garlic, exposing the cloves. Place in a small microwave-safe bowl and drizzle with oil. Add 1 tablespoon water to the bowl, then cover with plastic wrap. Microwave on HIGH for 2 1/2 to 3 minutes, depending on size of garlic. Let stand at room temperature for 5 minutes, then uncover and squeeze soft cloves of garlic from papery skin. 2 of 2 In a food processor, combine garlic cloves, chickpeas, roasted peppers, lemon juice, tahini, hot pepper sauce, salt, cumin and 1/4 cup water. Process until very smooth and mixture has an even texture. Add more water for a creamier dip. Refrigerate until serving, then garnish with chopped parsley. 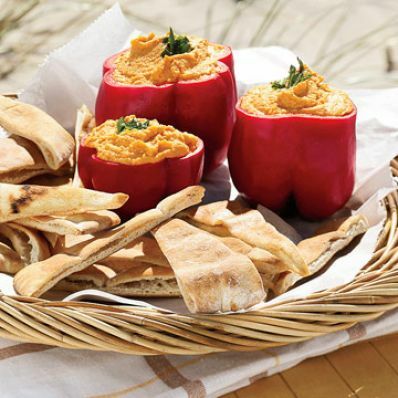 Serve with pita wedges. 1 of 1 Tahini (sesame seed paste) is sold in supermarkets or health food stores near other Middle Eastern foods. Per Serving: 273 mg sodium, 3 g fiber, 14 g carb., 5 g Fat, total, 114 kcal cal., 4 g pro., 0 mg chol.